The Hunter’s iconic progressive-style lunch is back for 2019. Now approaching its 26th year, The Lovedale Long Lunch has become a must do for dedicated wine and food enthusiasts , and for good reason too. Lovedale’s best boutique cellar doors and vineyards pair up with celebrated chefs and local restaurants with live entertainment from some of our region’s most loved musicians and performers. Save the date (it’s the third weekend of May) and gather your friends and book your tickets and transport. We’ve got info on each day and a few #protips below. Saturday is the big day, lots of fun and enjoyment with many loyal long lunchers – groups of family and friends, big and small. The weekend sees everything from themed attire to elegant day wear – such as the girls who come every year in a different coloured tutu, or the boys in stripped business shirts and moleskins. And then there are the ladies who would not be out of place at the polo. No matter what you wear, or your style, we want you to look your best. #PROTIP: Keep a lookout for Newcastle band, The Big Bang. Their annual set at the Lovedale Long Lunch has become one of the most anticipated events of the festival. For those of you that like your days tasting wine and food a bit quieter, then we recommend that you come to the Lovedale Long Lunch on Sunday. 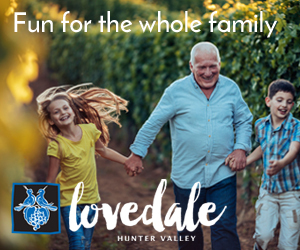 Grab your ticket, spend a relaxing day visiting your favourite Lovedale Long Lunch destinations, take advantage of the tasting tents, sample the extensive range of wonderful wines and sit back and enjoy a glass of wine with your friends. You’ll experience casual al fresco dining with food from the best restaurants the Hunter Valley has to offer and enjoy the music, reminiscent of days past of the Lovedale Long Lunch. #PROTIP: Looking for a fun Hen’s day out? The Lovedale Long Lunch is a Maid of Honour’s dream. Organise your transport and tickets in the one place when you book with Rover Motor Coaches. Your hen will have a great day out with the girls without you having to prep catering, drinks, entertainment, it’s already there at every Lovedale Long Lunch venue! The sparkling wines on offer are always a favourite. Come along to the 2019 Lovedale Long Lunch to sample the great choice of sparkling wines available. Try the sassy and slightly sweet sparkling red at Emma’s Cottage – it’s like no other – or the lovely sparkling Gewürztraminer at Allandale that smells of rose petals. If you love a bit of sparkle, Sandalyn is the place to go with their Traditional Methode Cuvee presented in a beautiful array of glitter bottles. Tatler has given the classic Hunter Semillon a “Carmen Miranda” look and a light sparkle that will pop your lid. Lastly, Wandin has a surprise new sparkling which is currently under wraps! #PROTIP: At Gartelmann Wines, owner Janette has put her name to a slightly sweeter style of Moscato with just a little bit of fizz. If a fragrant, pink spritz-y bubble is what you love, Saltire has you covered with their take on Moscato. You MUST try it! Every year the chefs keep providing us with amazing dishes and this year is no different. The fabulous restaurants joining “Long Lunch” for 2019 are Tatler Tapas, Wandin Café, The Deck Café at Gartelmann, Amanda’s on the Edge at Emma’s Cottage, Yellow Billy at Allandale, Hunter’s Quarter at Sandalyn and Emerson’s at Saltire. #PROTIP: Lovedale Long Lunch caters for all foodie needs. Light or hearty, there is something for everyone, and vegetarians and vegans are also well catered for. No need to pack your own! Groove, rock or just chill, to the great music from bands which have become venue favourites for the Lovedale Long Lunch. From smooth jazz vibes, classic rock, sixties to noughties, contemporary pop rock, old-school rock and soul, funk and blues – get your best dancing feet on and add more fun to your day! #PROTIP: Hornet are playing at Tatler Wines, if you are lucky enough to catch them play, ask the singer Ty to give you his best Neil Diamond. He absolutely kills it, you won’t regret it. All photos above are from the Lovedale Long Lunch Pty Ltd archives. Meal and drink options displayed may not be available at the 2019 event. Please check the website for current menu options. To enter, participants must explain in their own words why they should be the winner and tag a friend with a Facebook account into their comment no longer than 25 words in length. Responses will be judged by a panel of Newcastle Live staff and winner determined by this panel. Winner will be notified by private message. Responses may be used by Lovedale Long Lunch Pty Ltd for marketing purposes. This competition is in no way affiliated with Facebook. Prizes including helicopter flights, shuttle bus and Lovedale Long Lunch tickets must be used during the Lovedale Long Lunch event on 18 & 19 May 2019. Weight restrictions may apply to helicopter flights. Not all LLL venues have landing areas for helicopters, winner will be advised which sites can facilitate transfers. Entry for the competition is only available to Australian citizens and is not redeemable for cash. Entry is only open to participants who are over the age of 18 years old. Proof of ID will be required before claiming prize. Competition ends – midnight Wednesday 13 February 2019.